Link to the profile HERE. 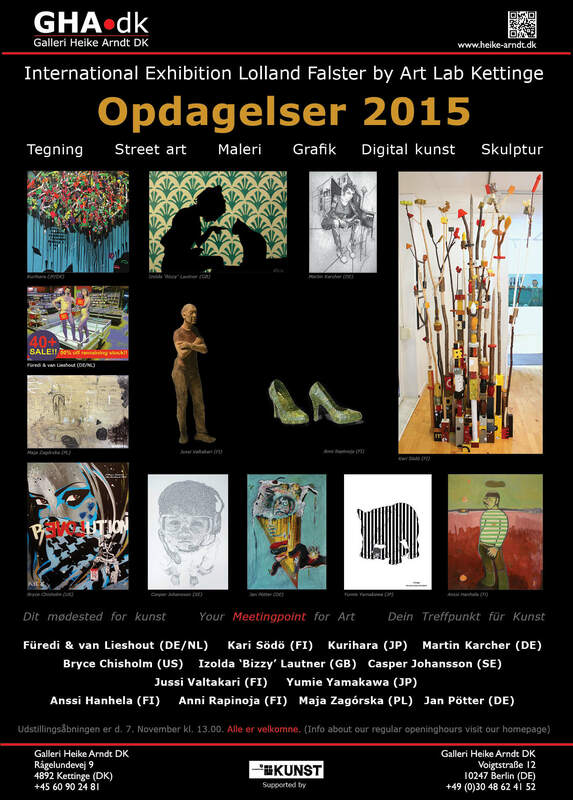 I am happy to announce that I will be part of the group exhibition OPDAGELSER 2015. 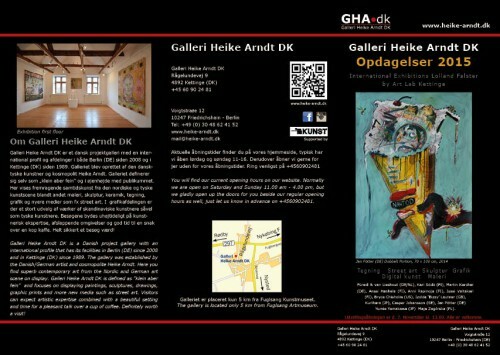 The exhibition will be held at Gallery Heike-Arndt in Kettinge, Denmark. 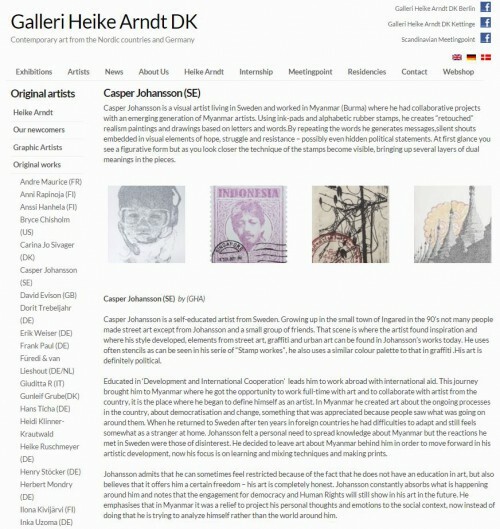 Here are a few words about the exhibition (in danish). Enjoy! 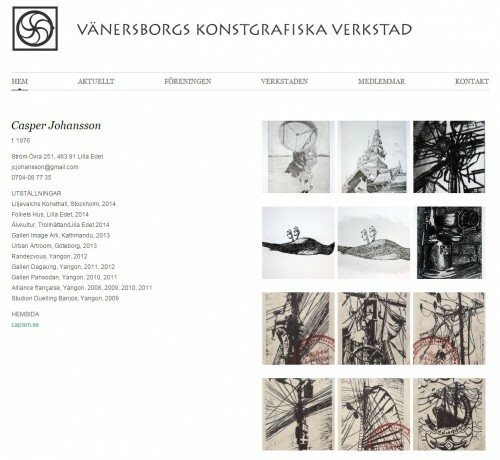 Opdagelser samler de bedste kunstnere fra årets udstillinger – 14 ekstraordinære kunstneriske opdagelser fra USA, Finland, Tyskland, Japan, Poland, Schweiz og Sverige, der alle har forbindelse til Norden og Tyskland. Anssi Hanhela (FI), Anni Rapinoja (FI), Jussi Valtakari (FI) and Kari Södö (FI) arbejder med innovativ brug af naturens ressourcer i håndlavede objekter, der står side om side med street art og stærke og politiske udsagn. Oplev den skarpe, sociale kritik i værkerne af Pötter (DE), den stærke fremstilling af det moderne liv i værkerne af Karcher (DE) og Zagorska (PL). I Chisholm (US) and Lautners (UA) værker præsenteres vi for raffinerede tekniske færdigheder med stærk indflydelse fra street art i lag af udklip, stencils og spraymaling. Füredi & Lieshouts (DE/NL) og Johanssons (SE) kunstværker fører vores opmærksomhed hen på vores nuværende samfunds værdier. De eksperimenterende farverige malerier, af Kurihara (JP) og mangategninger af Yamakawa (JP) der undersøger menneskelige relationer, ensomhed og skrøbeligheden indbyder til fordybelse.Ved hjælp af deres unikke stil og omfattende brug af forskellige materialer, der rangerer fra papir, lærred, tekstil til træ vil kunstnerne tage dig med på en rejse gennem tegneteknik, malerkunst, street art og skulptur mm. Det bliver en rejse fuld af overraskelser og opdagelser! Urbane vibrationer, poetisk farvelægning og legende humor vil være din ledsagerske i denne udstilling, så det bliver med garanti interessant! Kom og vær med! Dette er en mulighed for at blive inspireret, begejstret og involveret. Der er noget for alle i Opdagelser! What!? This week my painting “Don´t waste any time in mourning. 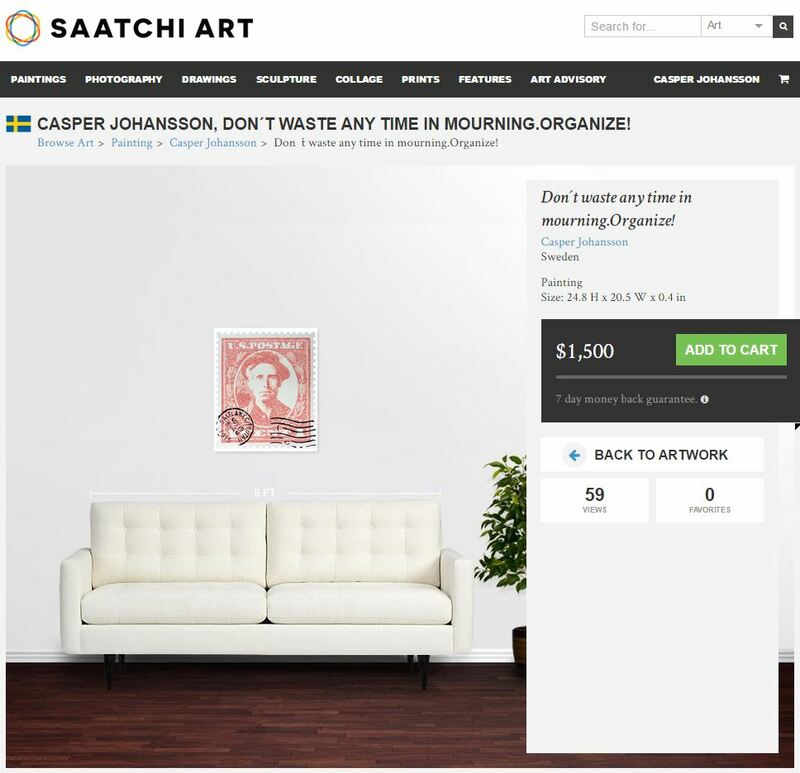 Organize!” is featured in Saatchi Online Gallery curated by Rebecca Wilson. Check it out HERE and remember that your investment is my playground. I am very happy to announce that I will be part of the exhibition “Fresh Legs 2015” opening at Gallery Heike-Arndt in Berlin on the 3rd of June 2015. The gallery is located at Voigstrasse 12, 10247 Berlin- Friedrichshain and the doors are opening at 7 pm and you are all welcome. At the bottom of the post you will find a brief introduction to the gallery and the exhibition in thier own words. If you need any more information you can contact the gallery here. Really looking forward to see you at the opening! Welcome! “In the annual Fresh Legs open call exhibition 2015 Galleri Heike Arndt DK proudly presents 20 talented emerging, international artists with unique styles, techniques and materials. Key concepts include portraying aspects of humanity as well as concerns about the development of our current society as interpreted by the artist’s individual expressions. Fresh Legs brings bold street art influences mixed with crisp drawings, social criticism with a dash of humor and challenging installations, the result is a mesmerizing and exciting group show that radiates with color and movement. 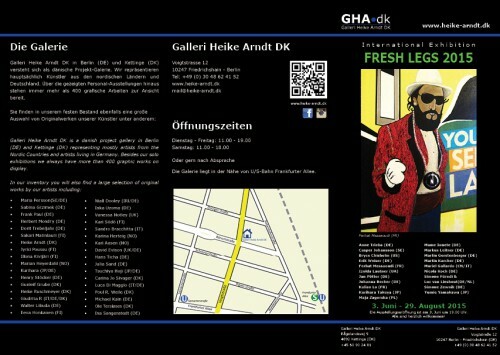 A total of 99 artists applied with nearly 1,000 artworks for the Fresh Legs show. After a long and comprehensive screening process 20 artists were chosen. 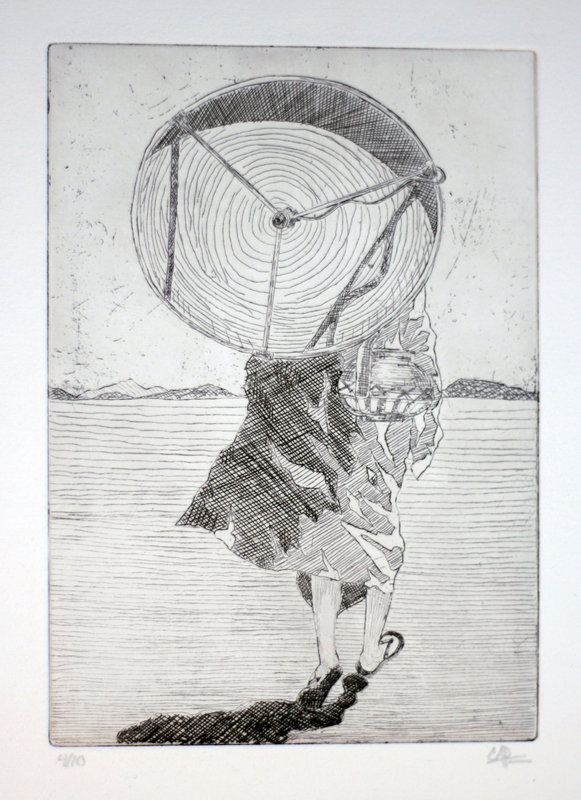 The Fresh Legs exhibition highlights a curated selection of these undiscovered rough artistic diamonds – and we are excited to follow their journey and see how they will cut and form their artistic edges. Experience the sharp social criticism in the works of Pötter (DE) and Gerstenberger (DE), the perfectly captured contemporary life in the works of Gallardo (CN/TT), Karcher (DE) and Zagorska (PL). In the pieces of Chisholm (US), Messaoudi (FR) and Lautner (UA) we are exposed to refined technical skills with strong influences from street art in layers of cut-outs, stencils and spray paint. The artworks of Koch (DE) and Furedi & Lieshout (DE/NL) brings our attention to the values of our current society in photographs and illustrations using a large dose of humor. In experimental use of materials and techniques – from stamp-like drawings, colorful paintings and sewn pigskin to plastic reflex-pieces used in traffic – the works of Weiser (DE), Zewnik (DE) Takuya (JP), Johansson (SE) and Trieba (DE) amaze and draw us in to examine them closer. 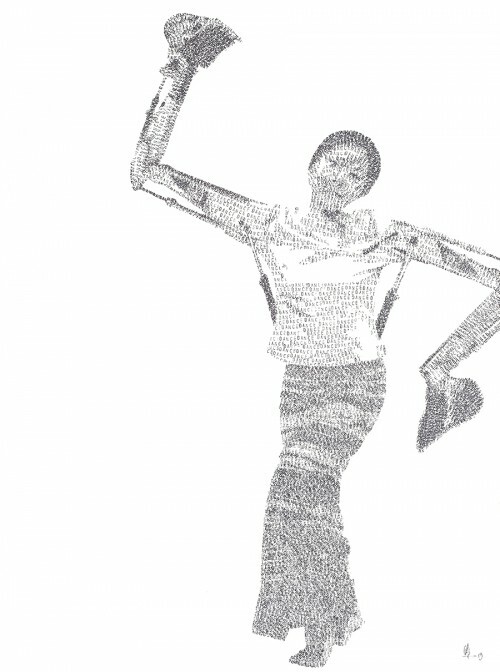 Yamakawa (JP) and Innete (DE) explore human relationships, loneliness and the fragility of the fleeting moment in illustrations and drawings. The photographs of Kalian Lo (FR) and the drawings of Becker (DE) take us on a journey to explore the environment and abandoned places of our time. Sold paintings at Transition this! 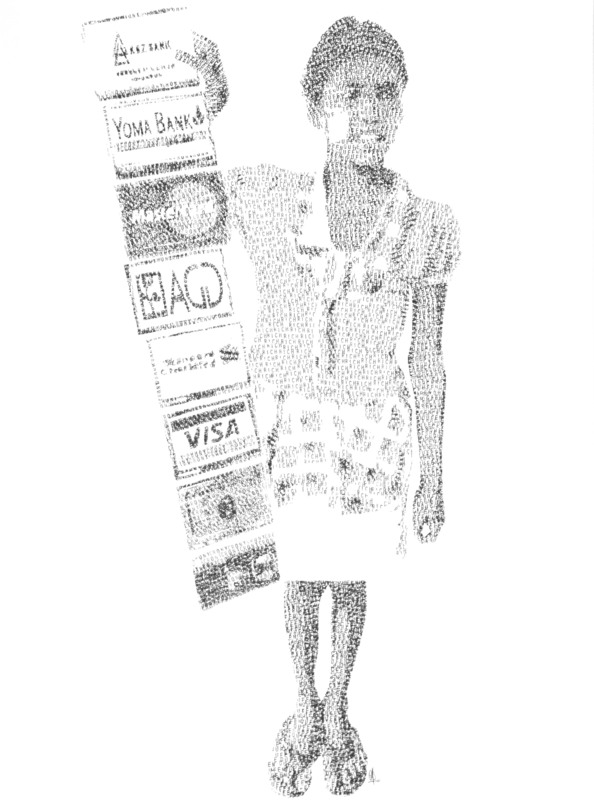 Cash is queen (SOLD), 2013, ink on paper, 56 x 77 cm. The Change (saturday night fever version) (SOLD), 2013, ink on paper, 56 x 77 cm. Diggers dance (SOLD), 2013, ink on paper, 56 x 77 cm. 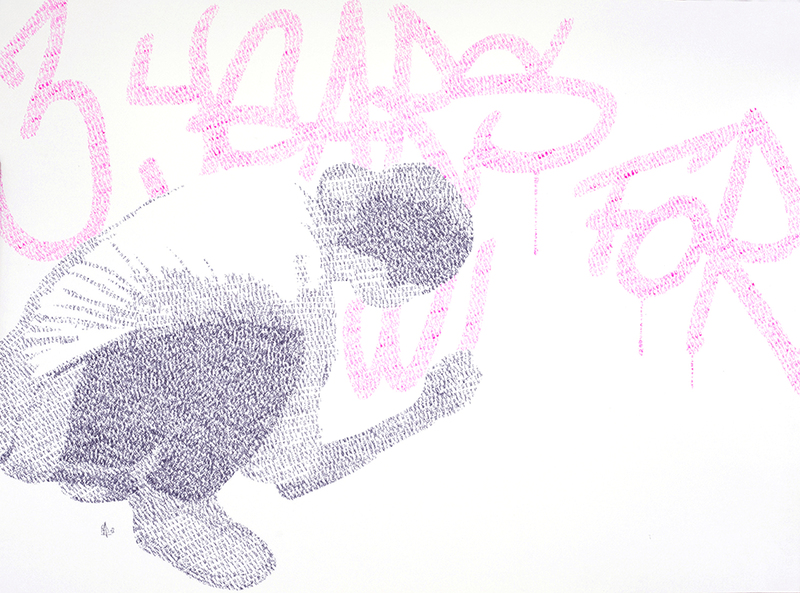 Your investment is my playground (SOLD), 2013, ink on paper, 56 x 77 cm. 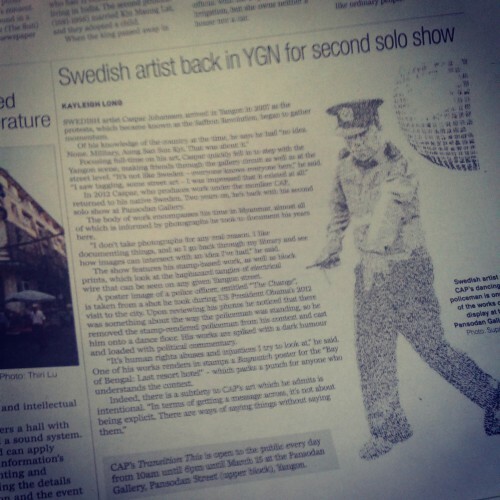 Swedish artist Caspar Johansson arrived in Yangon in 2007 as the protests, which became known as the Saffron Revolution, began to gather momentum. 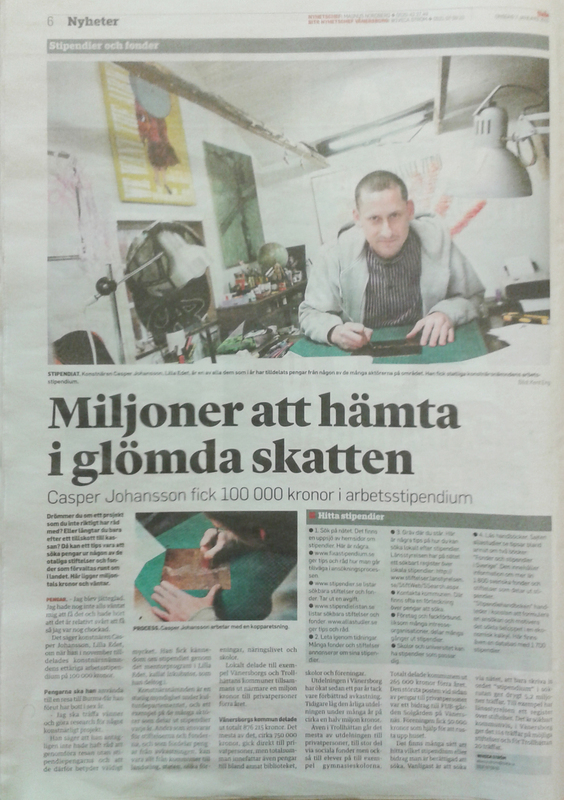 In 2012 Caspar, who produces work under the moniker CAP, returned to his native Sweden. Two years on, he’s back with his second solo show at Pansodan Gallery. The body of work encompasses his time in Myanmar, almost all of which is informed by photographs he took to document his years here. “I don’t take photographs for any real reason. I like documenting things, and so I go back through my library and see how images can intersect with an idea I’ve had,” he said. 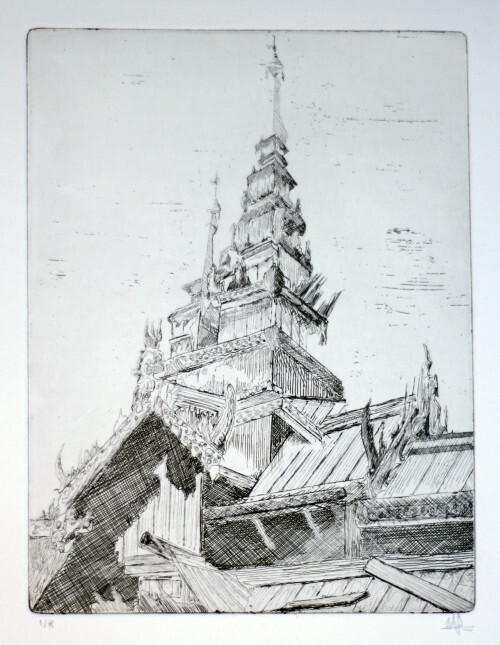 The show features his stamp-based work, as well as block prints, which look at the haphazard tangles of electrical wire that can be seen on any given Yangon street. 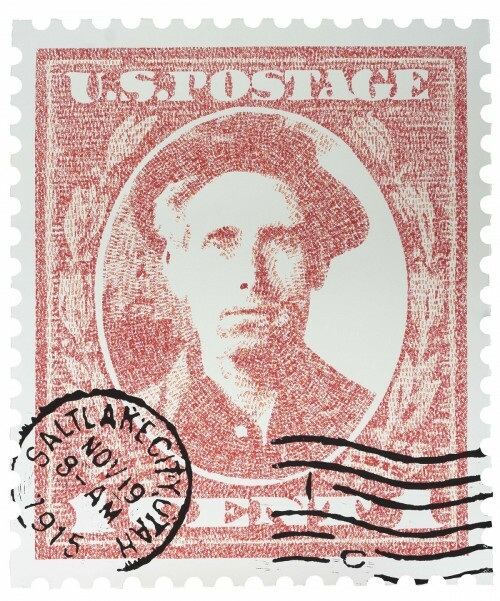 A poster image of a police officer, entitled “The Change”, is taken from a shot he took during US President Obama’s 2012 visit to the city. 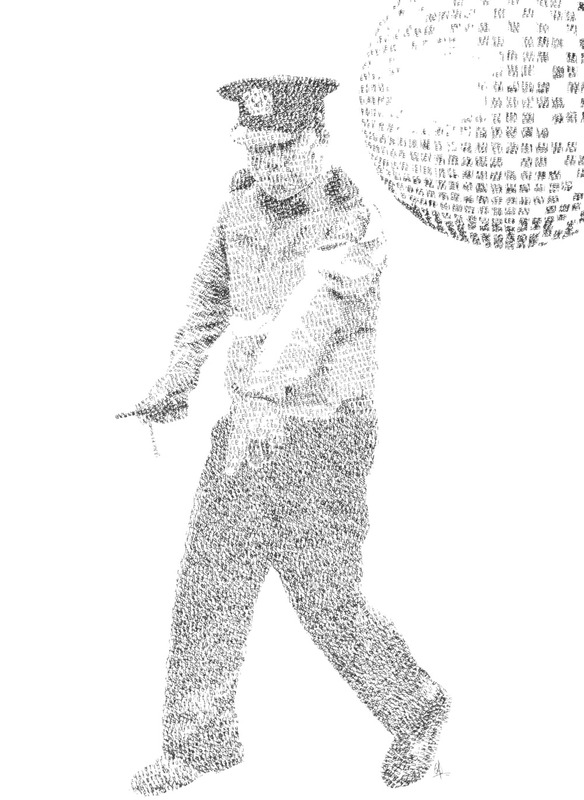 Upon reviewing his photos he noticed that there was something about the way the policeman was standing, so he removed the stamp-rendered policeman from his context and cast him onto a dance floor. 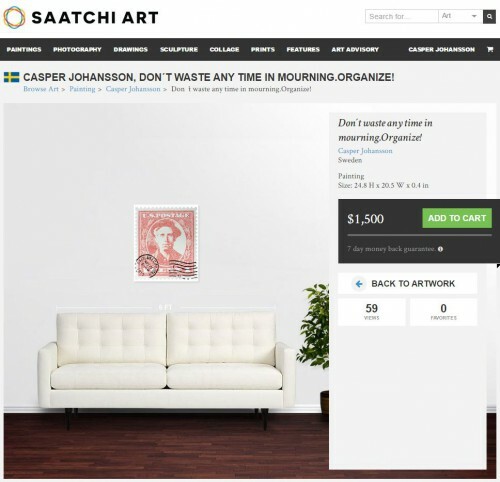 His works are spiked with a dark humour and loaded with political commentary. “It’s human rights abuses and injustices I try to look at,” he said. 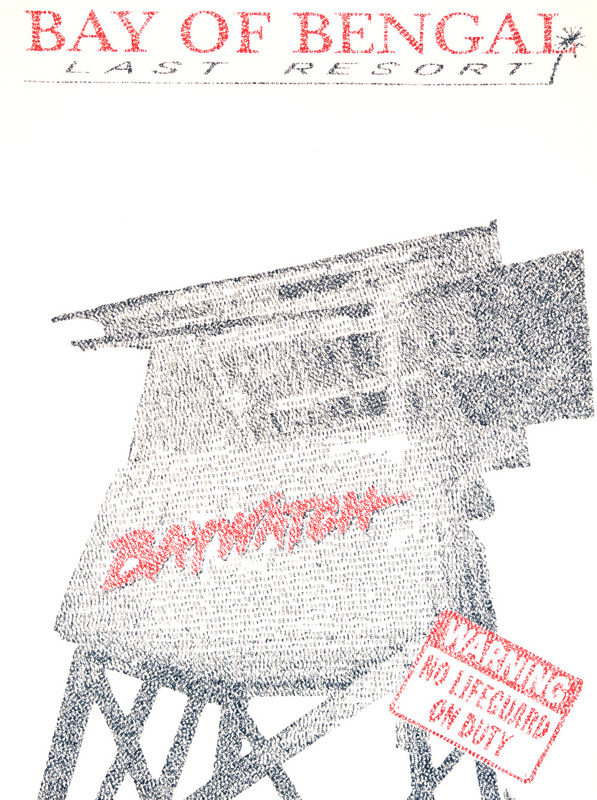 One of his works renders in stamps a Baywatch poster for the “Bay of Bengal: Last resort hotel” – which packs a punch for anyone who understands the context. Indeed, there is a subtlety to CAP’s art which he admits is intentional. “In terms of getting a message across, it’s not about being explicit. There are ways of saying things without saying them. Unfortunatly our webpage is only in Swedish but you can still enjoy our work HERE. Photos from the studio on the frontpage of the local newspaper TTela. The article is about grants and funds from various institutions up for grabs. 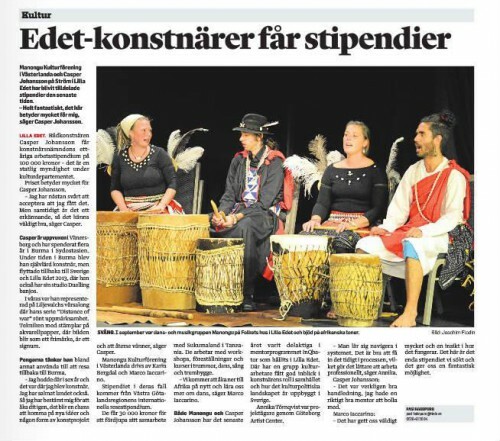 The article was published in TTela on 7th of december 2014. 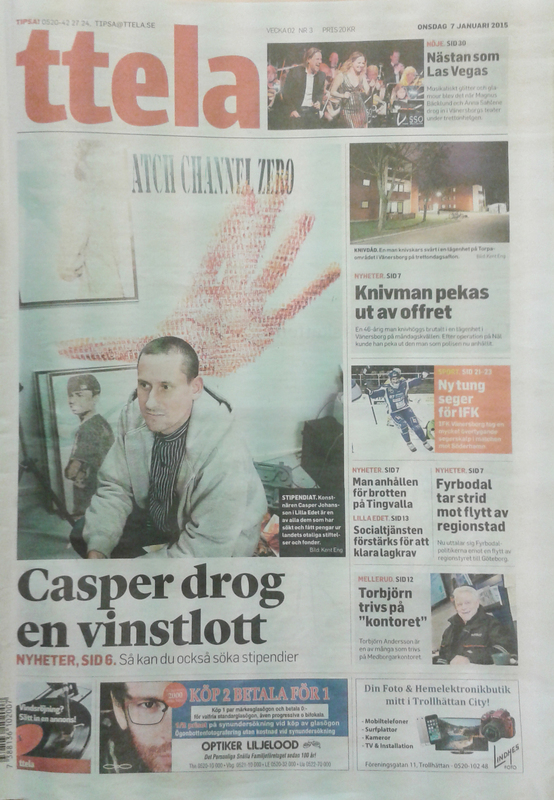 As for now the article is only published in the printed version. Early this year I went to Stockholm for some work and got the chance to put up a Duelling Banjos poster at my favorite petrol station in Örnsberg. 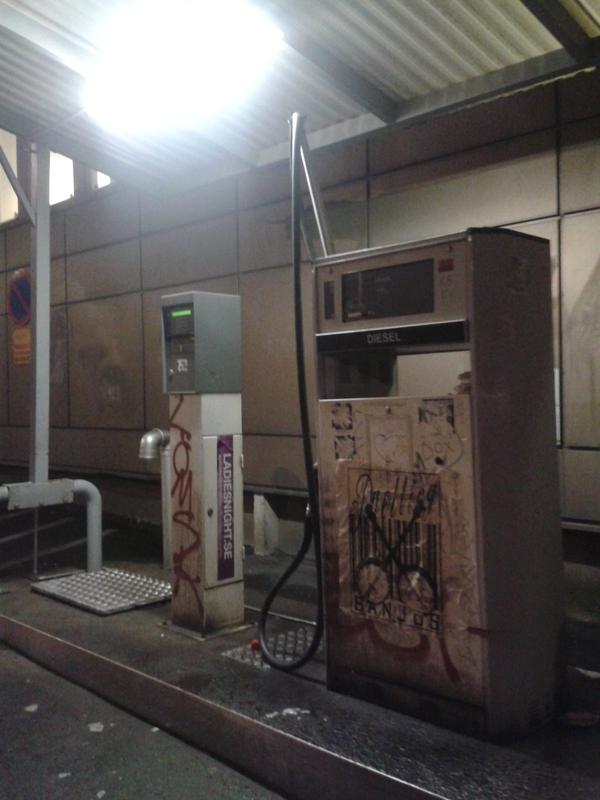 A few week ago I got information from a friend that the petrol station and the poster was part in Trentemöllers video Deceive (Lost and Found remix). Who would have known? It is a great song and I like the video alot. If you want to see it from start just click HERE. Thanks for having me and a shout out the ones involved with the video! A covering story based on the previous post about my assistant grant was published in the printed version of TTela. Congratulation to Manongu, really happy for you! Exhibition: Art for Aid at Gallery Momangen. New work, What if the blizzard….